?? | Välkommen till Ängelholms Flygmuseum! Ängelholms Flygmuseum was established at the initiative of the F 10 Comrade Association to preserve the memory of the fighter wing after the decommissioning in 2003. The museum was inaugurated in a modest form June 2004, after which it has developed into a well established workplace museum. The purpose is to show, what employees and conscripts worked with behind the Fighter Wing guard’s heavily guarded gates during the “cold war”. The museum is run on a voluntary basis with entrance fees as the main source of income. Today the Comrade Association holds approx. 2000 members, and the museum has approx. 20.000 visitors yearly. In 2011 the newspapers Norra Skåne and Skånska Dagbladet appointed the Flight Museum to Skåne’s best museum. In 2014 the museum was awarded Ängelholms municipality’s cultural price. Summer holidays: June 1st – August 31st 2019 10 AM- 5 PM. Christmas holidays: Open December 27th – December 30th 2019 and January 2nd – January 6th 2020, 10 AM – 5 PM. Fall – school holiday: October 26 – November 3, 2019, 10 AM – 5 PM. 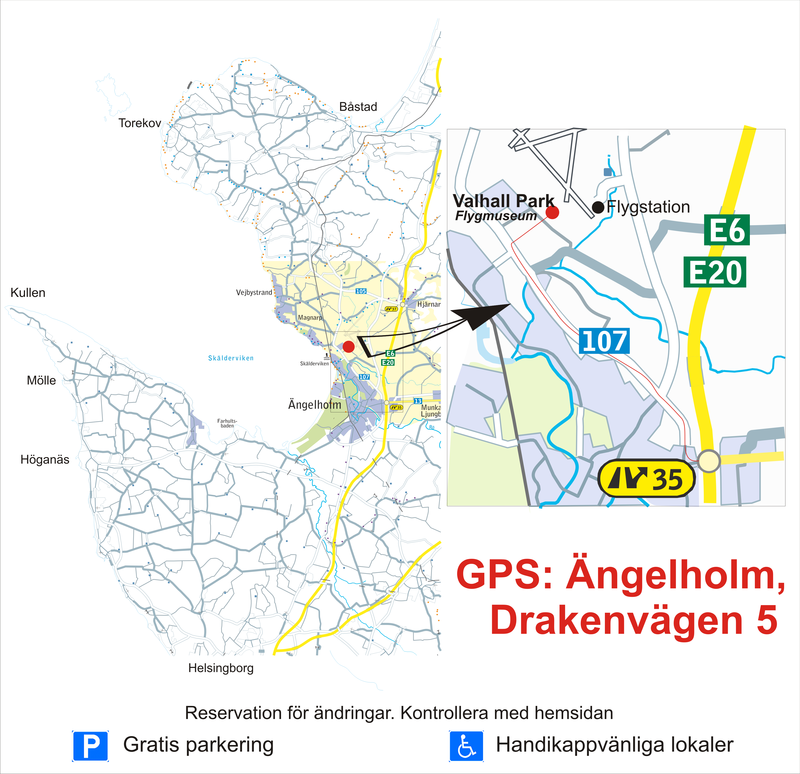 For groups with less than 10 visitor an opening fee of 800 sek is charged. We welcome groups on weekdays and weekends between 10 AM and 8 PM. A minimum of 10 visitors is considered a group. The guided tour lasts approx. 1½ hours. The museum shop offers a large selection of airplane related books, promowear, model kits, etc. The cafe offers coffee, soft drinks, cakes and ice cream to be enjoyed in the cafe or on the patio in front of the entrance. Search for and find our pilot teddy bears. During the school holidays 8 pilot teddy bears are hiding in our exhibition. Look for the teddy bears and join in to take the chance to win fine prizes from our shop. Drawing once a week. For a token worth 20 sek you get the possibility to fly our Knatte simulator. The token can be purchased from the reception. Put the token in the coin slot and take it away. During the 5 minutes, that you get to fly, you can try to land or find the big Smurf air balloon, that is located above the airfield. Intended for our youngest visitors. Ängelholms Flygmuseum has its origin in the F 10 Fighter Wing museum that was established at the initiative of captain Sven Sjöholm. During several years he took care of older expired equipment from the Wing , including objects from the time at Bulltofta airfield in Malmö 1940-45. At some point the opportunity arose to exhibit the collection in a 60 m2 barrack. This original small museum was inaugurated on January 13th 1984. However, this soon became too cramped, and the new solution was in 1994 another larger barrack on the parking lot at the Wing staff building. When the decommissioning of F 10 was initiated in 2002, a febrile activity started in the Comrade Association, and the planning of the current museum took place. The former Air Base area, that now was administered by governmental Vasakronan, got the possibility to rent parts of hangar 83, which had been built in 1945, when F10 moved from Malmö Bulltofta to Ängelholm. June 15th 2004 the former chief Brigadier General Bertil Bjäre cut the ribbon and declared the inauguration of Ängelholms Flygmuseum together with the ( the Comrade Association F 10 Kamratförening’s ) members, sponsors and especially invited people. June 19th the museum opened to the public. About 7 000 visitors came the first summer, and nowadays the museum has about 20.000 visitors per year. The museum is mainly run on a voluntary basis by a number of 70 members from the F 10 Comrade Association, that today holds approx. 2.000 members. The essential contribution to the operating costs comes from visitors’ entrance fees. The museum displays 10 airplanes, from J 22 to JAS 39 Gripen, that all have been active within the Wing. You can also try sitting in a Draken cabin or flying a Draken simulator (please see flight simulators). The museum also displays engines, flight safety equipment, flight radios, associated equipments, meteorology, ground defenses, underground command center and a “secret” mountain cavern with battle command center. Do you want to experience flying a J35 Draken, just like the Draken pilots in the Air Force did during the cold war, then you have the chance here. The simulator is constructed by using the front part of the body of a real 35 flight from the F10. With the modern technology it ”flies” quite realistically. Several of the instructors have themselves flown Draken in the Air Force for many years. A flight in the Draken simulator consists of: 1. a review before flying, 2. flying and 3. a brief review after flying. The flight course lasts an hour and costs 500 sek. Reservation to be made by calling +46 725-60 35 35. Here you can also ask questions about flying the simulator. To fly the simulator you must be able to climb up and down the stairs to the cockpit. Your age plays a minor role, but your height must be min. 160 cm. If you would like to learn to fly a J35 Draken, we offer a simulator training, that includes 12 lessons with everything from ordinary flying to advanced flying in formation and group (2-4 planes in connection), along with flying in darkness and instrument flying. Possibility of flying several different types of airplanes. In this simulator the airplane is controlled by a joystick as steering wheel, and the instruments are shown on a computer screen. Here you can choose between flying some of the F10 airplane types, that have existed, for instance : SK 61 ”Bulldog”, SK 60 or J35 Draken. 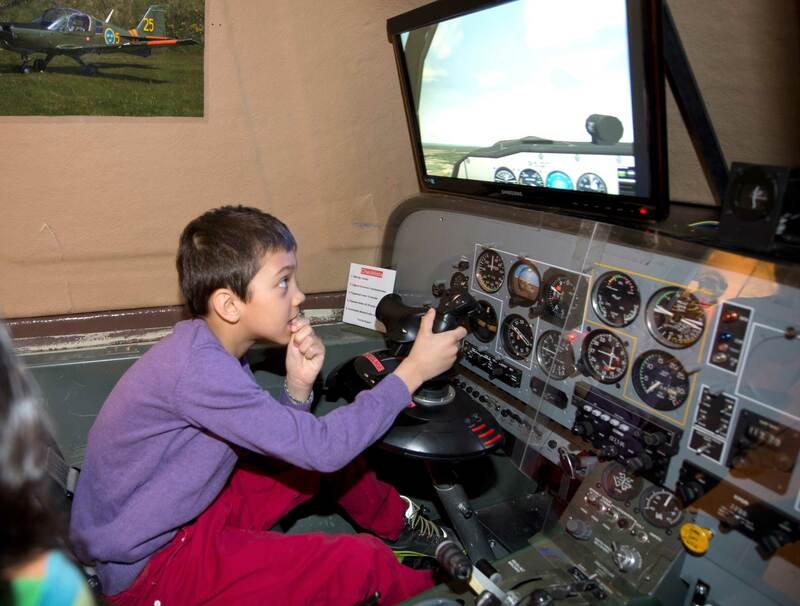 This flight simulator is available during the flight museum’s ordinary opening hours, and tickets are sold at the reception. Price 75 sek (approx. 10 minutes of flying). The simulator instructors have seen so many ways of landing our airplanes, both possible and impossible ways. So it is lucky, that you cannot damage neither yourself nor the airplane, that you are flying, even if it looks that way. Someones ego may get a little crumbled, this is our treat to you. Many different nationalities have visited us, and sometimes there may be some language problems, but with help of sign language we’ll always manage anyhow. First of all everyone finds it real fun and willingly do it again to improve themselves, which most of them succeed at. Adapted to the youngest simulator pilots. This is originally an instrument flight simulator SK 61 Beagle Bulldog, that previously was used at the Traffic Flying College in Ljungbyhed, where many of today’s commercial pilots started their career. After generously placing it in Ängelholms Flygmuseum a more simple flight simulator has been mounted in the cabin and now offers a flight of 5 minutes for 20 sek (tokens can be purchased from the reception).